Norton Radstock Photographic Society: Architecture Competition proves challenging! RECENT NEWS > Architecture Competition proves challenging! Looking for drama, scale and impact! Photographing architecture is quite a challenge! As well as meeting all the usual compositional and technical success crieria, overcoming converging lines and dealing with the sheer size of it all pose additional problems. Popular judge, Simon Caplan, was clear about what he was looking for on Thursday, and he set the bar high with only six of the 30 odd entries in each category making the final cut. Simon gave useful feedback and tips as usual, advising on exposure compensations, filters and choice of viewpoint. His sympathetic, if incisive, comments showed an understanding and empathy with members trying to achieve something different. He tells it like it is …but nicely; often softening the blow by describing his comments as “an old judge’s whinge”, but he is clearly not a fan of special effects in post processing or too many people in the frame! Bill Collett’s fascination with all things engineering paid off on the night, with three of his images being commended together with Jane Richardson’s image of an unusual Heexagonal House in Exmouth in the colour section. However, many of the other entries lacked the drama, scale and form that Simon sought. There were examples from ancient and modern structures, but none that really explored the potential afforded by patterns and forms in close up that might have caught his eye or provided more emotional impact and “wow” factor. Instead, we filled the frame , cropped too closely or overdid the lead in lines and angles that often bring success in other genres. Only Ivy Goacher and Jenny Short’s attempts at looking up were rewarded with a 3rd place and a highly commended respectively in the monochrome. 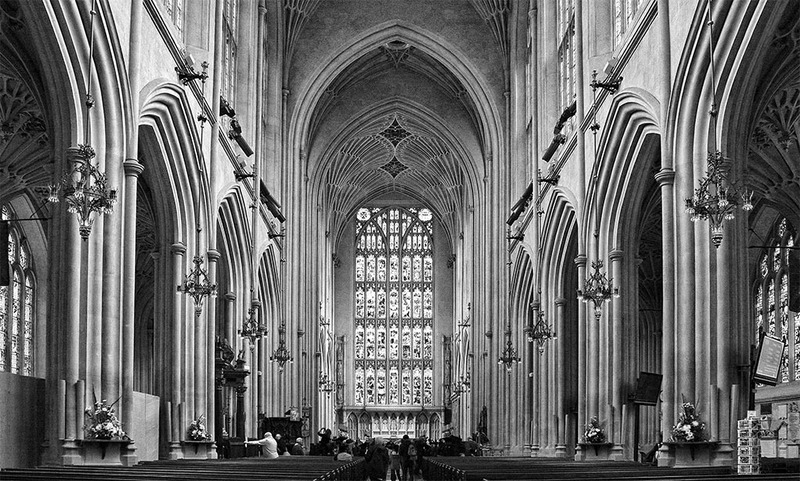 Diana Walker’s rendition of the Wilton Windmill was placed 2nd in this category, to the scale and splendour of Graham Nicholls’ Bath Abbey interi,r that was the eventual section winner. In the colour competition, Diana had further success capturing the scale and dominance of Blenheim Palace (highly commended) and the lights of a Vancouver skyline at night, which was placed third. Jill Toman took the honours of second place with the interior view of Bangkok Airport, taken during a long wait between flights. It was Jill’s “Old and New in Liverpool” that met the criteria of drama, scale and impact that took a well deserved 1st place in the section. It was a very useful evening in which we learned we need to be more selective about the time of day we choose to photograph impressive structures, to get the most out of the light. Further food for thought about either getting up really close for the detail or standing back and capturing the context of the subject in the landscape, sent most of us away knowing we need to get back to the drawing board! Simon was warmly thanked by Margot for his comments and insight, and members were urged to finalise preparations for the upcoming Exhibition, which will take place at the Methodist Hall on the last Saturday of this month .